You voted! Introducing the 50th Anniversary team, the 50 greatest Oakland A’s players! We’ll celebrate this group throughout the 2018 season. This is a fan-voted list so I can understand that it’s not perfect. For example, players like Scott Hatteberg shouldn’t be in it but because of one swing, he’s in. As an A’s fan though, it’s nice to see some current players. Then also to be reminded of players that were traded away at their prime. It’s an interesting list that takes me down memory lane. What a time to be an A’s fan! In a ticket brochure sent out to season ticket holders, the Sharks unveiled a new logo for next season and all signs point to it being their 25th anniversary logo. (I remember them celebrating their 20th anniversary and somehow five years have gone by just like that.) 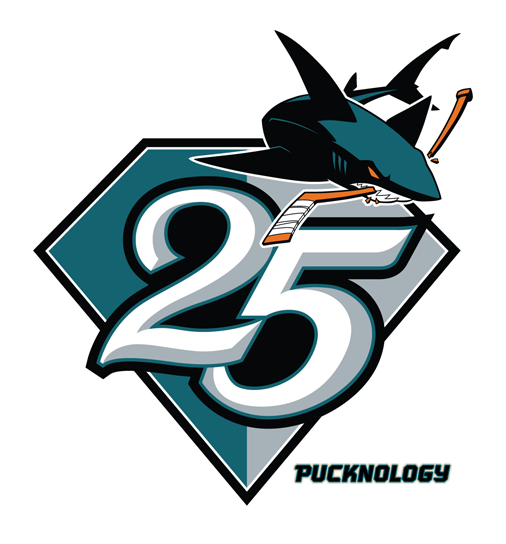 The logo, courtesy of Pucknology, reveals the shark in front of a diamond with the number 25 placed right in the middle. This a new look for the logo of the shark with the tail coming from a different angle (instead of the one you see on the thirds). I like the diamond and the number using the team’s original colors and limiting the orange just to the stick and the eyes. It’s a simple anniversary logo and it’s pretty tame. But for a team that is embracing a simple look with their uniform, it seems fitting that this logo is also simple. What do you think about this logo? Jimmy Traina of Sports Illustrated pointed out this morning that YouTube is celebrating its 8th birthday today. On this day eight years ago, the site launched its first beta public site. It would later on in months when everyone would be able to use it, but May 20 was when it first breathed life to the Internet world. With that in mind, I decided to check what the top 10 sports videos of all time were in YouTube’s history. Some featured some great diving videos from sides of cliffs. Some where bodybuilding videos. Some were put in the wrong category. And at #10 with over 44 million views, we have this nonsense. Thanks YouTube for providing us great things even though we don’t upload the best things.